Those various clever contraptions of many sizes, shapes, and materials that we conveniently lump together into the category of "puppets" may lack volition of their own. Yet when guided by theatrical imagination, they can prove remarkably animated. Federico Restrepo kept both puppets and human beings lively in his "In Retrospect," a meditation on time, memory, and human affection created in collaboration with Denise Greber. Restrepo designed, directed, and choreographed the piece, and its effects were enhanced by a fine score by Elizabeth Swados played by Sebastian Quiroga and Yukio Tsuji (who also provided additional musical composition), sitting on a little balcony at the right side of the auditorium. As situations demanded, the multi-textured music ranged from anxious percussive pulsings to ethereal chimes, and there were melodies graced with a dreamy sweetness. Federico Restrepo and a hanging globe containing a family picture. Photo by Bobae Kim. The first thing viewers saw in the hour-long work was a red-brick wall with three windows from which Sara Galassini, Allison Hiroto, and Restrepo peered, as if scanning the street as apartment dwellers the world over love to do. They could have been members of a family, and the impression of familial solidarity was heightened when videos depicting cooking a meal were projected on the window shades. When the wall disappeared, little balls resembling Christmas ornaments descended to tinkling music. Each had a picture of something inside it although, at least from my seat, the subjects of these pictures remained indecipherable. Yet, serving as thought bubbles, they clearly meant something to Restrepo, summoning up memories and emotions. Two large doll-like figures, possibly representing parents, entered, controlled by black-clad humans (the work's agile puppeteers were Allison Hiroto and Sara Galassini) and Restrepo danced as if lost in thought. A video showing eye motions was accompanied by narration explaining what these motions might emotionally signify. But when masked dancers appeared, it was impossible to see their eyes, and when they removed these masks there were others beneath them (I counted a total of six layers of masks). Federico Restrepo dances with life-sized puppet. they are all children of a mother." L-R: Allison Hiroto, Sara Galassini, Federico Restrepo. 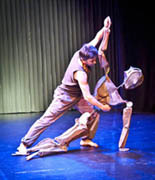 "In Retrospect" made its points through full-body motions for both humans and puppets, and through other video sequences, as well. Restrepo swung a doll about in a pas de deux to a gentle melody. Galassini made frantic attempts to plug in an enormous telephone and waited anxiously for it to ring. When it did, she repeated "Hello, hello, hello" so rapidly and often that the words blurred together and started sounding like "No, no, no." Petrouchka popped out of a jack-in-the box and Restrepo made his gestures echo those of Stravinsky's forlorn puppet. A video of a woman vainly trying to build a house of cards was accompanied by a text reminding us that illusions easily collapse. 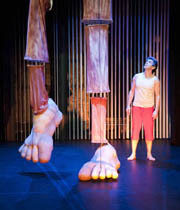 ENORMOUS LEGS -- Federico Restrepo and Mother's Legs. Photo by Lee Wexler. The three live performers removed marionettes from a rack at the back of the stage and made them walk and dance as if they were their children while the text praised motherly love, declaring, "All men are equal because they are all children of a mother." When enormous legs descended from the flies and planted their feet on the ground, Restrepo clasped them, as if they came from some giant protector. Finally, he was joined by one of the parental dolls from the opening scene. But the other doll, which presumably represented a mother, had vanished. "In Retrospect" had become a touching meditation on maternal affection and its loss. Productions combining people with puppets may raise certain questions: Are puppets really necessary here? Or are they only ingenious attention-getting devices? Couldn't most of the same dramatic points be made with an all-human cast? In the case of "In Retrospect," the puppets did seem necessary, and not just to create effects of bigness and smallness. 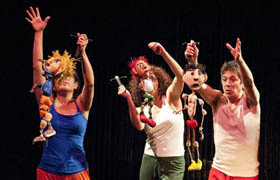 Restrepo's puppets, though often like humans in appearance, were non-human. They served as archetypes or figures of fantasy or memory. Although they could move, they could not modify their essential nature or emotional capacities. Restrepo, as the work's protagonist, could, and he moved quite well in many ways. But however he moved, he always encountered these figures, some grand, some tiny, but all in some sense unalterable figures that led him into ever shifting states of human joy or grief.